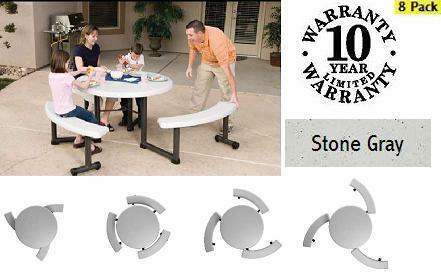 Lifetime Picnic Tables - 2128 Lifetime Round Swivel Bench - Stone Gray - 8 Pack - Shipping Included! Lifetime picnic tables are constructed of high impact polyethylene and are stronger, lighter and more durable than wood. They will not crack, chip or peel, and are built for indoor and outdoor use. The patented steel frame provides a sturdy foundation and is protected with a powder-coated finish. Umbrella ready! Lifetime 2128 Picnic Tables have swivel benches allowing you to adjust the space they take up! Lifetime Tables are Great for Thanksgiving, Christmas, & New Years Feasts, Camping, Boating, Fishing, Picnics, Sporting Events, Recreational Activities and More! Dimensions: 45" x 45" x 44"